Check your inbox 📬, the latest newsletter has been circulated to existing club members! The new Verge gear shop is now open for orders, all details are in the newsletter. It will remain open until the 17th April. All orders must be placed by 17th. This is your opportunity to gear up for the upcoming season. Do not miss the order window! 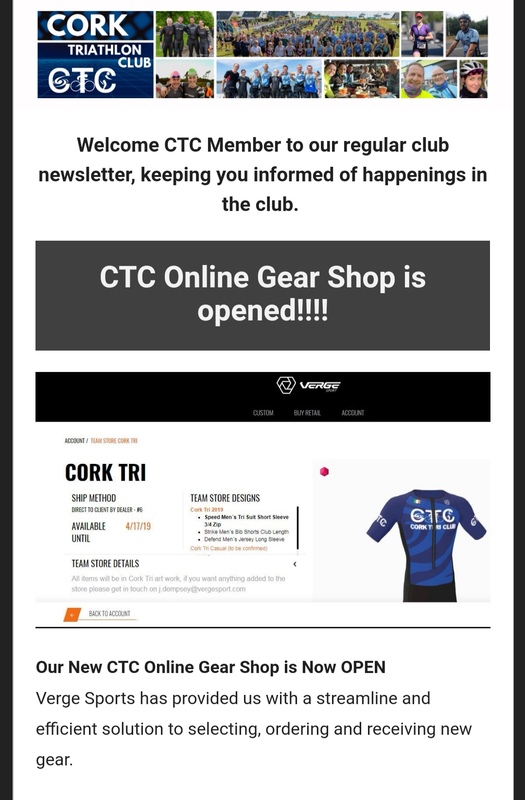 In the event you have not recieved an email from cork tri, please first check your junk or promotions folder and ensure you have already renewed your membership. For Gmail users, it’s possible the email may land in the promotions folder, if it does ensure to add events@corktri.com to your Google Contacts and move the email to your primary folder. Note club emails are circulated to the email address you used to register with Triathlon Ireland. ← Leisureworld Swim Sessions Space Remaining!